Allison of Fraske Designs has researched some recurring themes in some Boston Handmade members' work. This is the third of a series of posts on the topic. Lucie of Lucie Wicker Photography notes the presence of trees in her work: "I have always been attracted to trees- their roots, trunks, branches, leaves, blossoms, etc. I love the shapes bare branches make, they are so intricate and delicate at this same time. It was always a subconscious thing but in retrospect, they do pop up in my work more often then anything else." 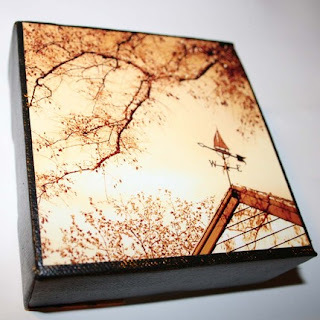 This Sepia Weathervane photo on canvas is one of my favorites! "For images, I keep coming back to trees and the human form. In my mind they echo each other, and both are evocative of our inner lives. For my commercial work, I use literal images - my drawings and photos - and explore how they fit in an imaginary, abstract landscape. 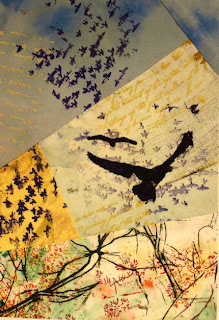 Often I use text to illuminate the space and the meaning." "I make little spun cotton figures for every holiday, occasion and for everyday display and I always find myself coming back to making bunny people and cat people. The reason? Popularity. I like to please the masses and the masses seem to love my bunny and cat people and I couldn't be happier making them!" 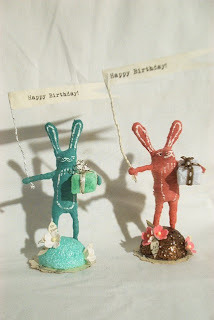 How adorable are these birthday bunnies? We love to hear feedback from our readers: What recurring themes appear in your work?